A key advantage to Okuma ownership is the single source supply of Machine and Control as signified by the Okuma corporate logo. 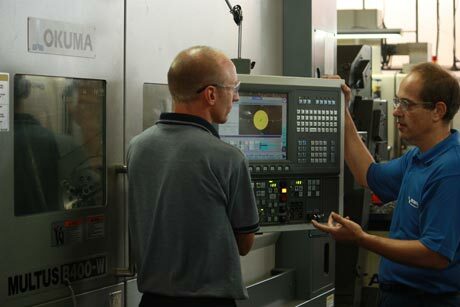 Okuma mainly employs our own Okuma OSP CNC system. So, for the decades we've been supplying long lasting machines around the globe, we've had a lifetime support policy and a real ability to actually deliver spare parts for our machines and controls. It's also been our policy to hold significant spare parts of both mechanical (including main spindle sets) and changeover electrical parts and assemblies. Our relationship with Fanuc is similar in that we have a product supply agreement with Fanuc to supply the Robocut EDM Wire machines (in Australia) and the local Fanuc capacity compliments our field activities for some limited number of Okuma machines that are optionally equipped with Fanuc CNC systems.khoyne_crop. Again, it's important to know where you stand regarding support and spare parts when you invest in machinery expected to last for years and years. For more information about our Spare Parts please call us on 1300 1 OKUMA (1300 1 65862) or email. Products All Okuma, Fanuc RoboCut, RoboJob, LNS, other. Callout rate by Air flight Flight cost +5% plus $80 per hour airport to airport time, return. For customers within Australia only, you may be eligible to join our unique Services system; Okuma-PAC (Professional After Care). Click on the Okuma PAC tab for more information. 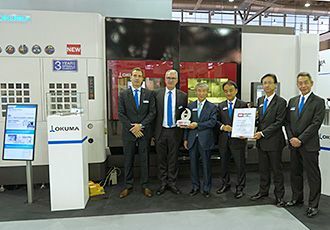 Okuma invests in highly qualified and experienced Applications Engineers. Their role is to train and assist our customers in safely deriving the maximum performance and benefit from their investments in CNC Machines, whether old or new, multifunction, turning, milling, grinding or EDM Wire. Again, our policy is to guarantee access to Applications Engineering and with all new installations afforded 12 months unlimited applications support. Beyond the on-board CNC system fitted to machines, our applications group, by company policy, work closely with our customers who wish to integrate CAM systems. Okuma recommends our own ADMAC System. A critical part of getting the most from a machine tool is the training and advice you can get from the builder or their representative. Okuma is your single source solution for productivity gain. 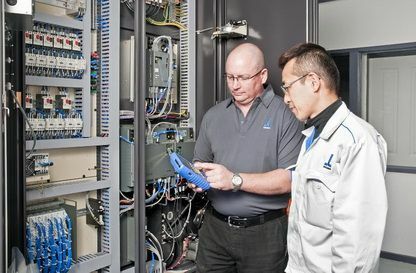 A key part of Okuma's responsibility comes in our delivering quality safety, operation, programming and maintenance training. Okuma sets no time bar or limit on training. We know when operators are competent to safely take over the operation and programming of an Okuma machine and that time taken can vary. Our experienced Applications Engineers engaged in customer training will monitor progress, set the pace and regularly report progress to management. Again, our training is available for operators on Okuma and Fanuc Robocut machines of every age and model. Manufacturer of compact, user-friendly, cost effective and portable robot systems to automatically load and unload CNC Lathes, Machining Centres and other production machines. Global leader in designing and manufacturing CNC Lathes, Machining Centres, Grinders and CNC Control and related drive systems. World leading designer and manufacturer of Bar feeding and handling equipment, swarf conveyance equipment, air filtration and coolant management products. JIMTOF is the highlight of the Machine Tool calendar! Iconic supplier of Wire Cut EDM (Robocut), CNC Drills (Robodrill), Industrial Robots, Injection moulding machines (Roboshot), CNC Control and related drive systems. Okuma Australia is a foundation member of the Australian Manufacturing Technology Institute Limited (AMTIL). Australian Machine Tool Distributors Association comprises individual members who have dedicated their skills, knowledge and experience to advance the importance, quality and performance of the Machine Tool Industry in Australia and who have done so throughout their careers with endeavour, respect for others and integrity.